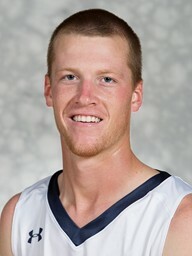 Connor Scott, a senior, is a two-sport athlete at Cedarville, playing both soccer and basketball. Connor Scott experienced a situation that most people can only dream of. In his last collegiate soccer game, the G-MAC championship, he scored a goal that became the difference in a 1-0 victory for the Cedarville men’s soccer team, winning the conference title. Five days later, Scott traded the grass for the hardwood, stepping into the gym to prepare for the upcoming basketball season. According to Scott and his coaches, his determination and passion for sports and other people help him to excel on and off the field and the court. Scott’s collegiate soccer career got off to a rough start. He played four different positions his freshman year and was unable to gain confidence on the field. Todd Beall, the head coach at the time, told Scott he was in danger of being cut from the varsity team. Scott said Beall liked this attitude and gave him a trial in the winter and spring to see if he could improve. Scott credits God with getting him through that time. “It was a huge God thing that I was able to stay on the team and be able to be successful,” he said. Current head coach Brett Faro, who was an assistant coach when Scott came in, recalled that Scott was a very raw player at first. Faro said that Scott accepts criticism and uses it as a chance to improve. This is evident in Scott’s growth since freshman year, Faro said, and he is not the same player that stepped onto the field in 2011. In his senior campaign, Scott led the team in assists and was third on the team in goals scored. Faro said he has been impressed with Scott’s work ethic, positive attitude and dedication and said he enjoyed watching Scott develop as a player. But Scott is more than just a good soccer player, Faro said. He is a selfless teammate. Although he scored three goals in this year’s conference tournament, Scott didn’t pat himself on the back. Instead, he gave the credit to his teammates. This unselfish attitude has followed Scott to the basketball court. In the winter of 2013, he talked to head coach Pat Estepp about joining the team. Estepp told him the team could use a practice player to help the other guys improve, and Scott accepted. The transition from soccer to basketball was rough at first. Scott had to find time during the soccer season to take part in basketball workouts. He went from being one of the tallest and most athletic members of the soccer team to one of the shortest and least athletic members on the basketball team. But this wasn’t the most difficult part of the transition for Scott. Despite this, Estepp said Scott has impressed him so far. Because of the conflicting schedules of the soccer season and basketball preseason, Scott was unable to participate in many practices with the basketball team. The night of the team’s season opener, he’d only had two practices under his belt. Although he had played in front of big crowds before, Scott admitted to being nervous before the game. Although he is currently a practice player who sits on the bench for most of the game, Scott is not complaining. Scott has gotten the attention of the coaches due to his determination and non-stop motor. A physical education major, Scott said he hopes to coach basketball at the high school level after graduation. One of the reasons he joined the basketball team, he said, was so he could learn enough about the game to coach others in the sport. Scott said he doesn’t want to be only a coach, but a good role model as well. Scott isn’t waiting until he lands a coaching job to start leading others. Faro said Scott has excelled at being a leader on the soccer team. No Replies to "Two Sports, One Goal"